ANAHEIM, Calif. — Scott Niedermayer accomplished a lot during his 18-year NHL career. The Hall of Fame defenceman added one more to the list on Sunday night when he became the ninth player to have his number retired by two teams. The Anaheim Ducks raised Niedermayer's No. 27 to the rafters at the Honda Center, honouring their former team captain, who helped lead them to their only Stanley Cup title in 2007. He first had his number retired by the New Jersey Devils in 2011. 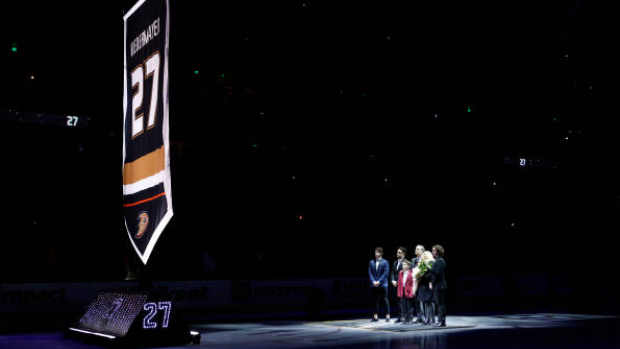 The Ducks honoured Niedermayer before their game against Washington and culminated a week of events celebrating the franchise's 25th season. Niedermayer signed with Anaheim in 2005 after 13 seasons with New Jersey. He scored 60 of his 172 career goals in five seasons with the Ducks, and remains the franchise leader in goals, points (264) and power-play goals (39) among defencemen. Niedermayer also held the assists mark until Cam Fowler passed him during the Ducks' 5-2 win against the Capitals. Ever the consummate teammate, Niedermayer mentioned every player and coach on the 2007 title team before his number was raised. The most important teammate though on that club was his brother, Rob. Scott Niedermayer said after the ceremony that the 2003 Stanley Cup Final, where his Devils beat Rob's Ducks in seven games in 2003, put the wheels in motion on trying to play with his younger brother. "When we were 10 years old we would have loved to beat the heck out of each other in a Stanley Cup game and rub it in. When we were older in 2003 it was a different story," Scott Niedermayer said. "To win a Stanley Cup here exceeded what I thought was going to happen." Niedermayer won the Conn Smythe Trophy, which is given to the Most Valuable Player of the Stanley Cup Playoffs, after the Ducks defeated the Ottawa Senators in five games. "The bigger the game, the better he played. He is the greatest champion of our generation," said former Anaheim great Paul Kariya. "His ability to control the game on offence and defence was unmatched by any player." Niedermayer was the first player in hockey history to win a Stanley Cup, Olympic gold medal, World Championship, World Cup, Memorial Cup and World Junior title. He is also the only player to have won a combination of four Stanley Cups and two Olympic gold medals. Niedermayer is the third player to have his number retired by Anaheim. He joins the No. 8 of Teemu Selanne and Kariya's No. 9. "It was enjoyable. It was good to sit back and reflect," Niedermayer said.